PC gaming is about escapism. Sometimes that means driving a car really fast, or inhabiting the body of a seven-foot fish person with dual scimitars. Other times, it means living out a romance that could never be. In today’s Weekend Esc, Rich and Alice run through the greatest love stories in PC games. Admittedly, more than one of those couples co-stars Geralt, but that’s branching narrative for you. A recipe for polyamory. Speaking of RPGs, the show covers news on Kingdom Come: Deliverance, the Bohemian adventure that’s selling extremely well despite some controversial design decisions. If you’re struggling with that strict rest system, here’s a way to get unlimited saves. Then, of course, there’s this week’s RPG-themed giveaway. We’ve got a copy of World of Warcraft: Legion up for grabs, as well as a limited edition signed Elder Scrolls Online poster. To enter, just complete one of the actions in the widget below. Or more than one, if you like – that will increase your chances of winning. In return, we ask only for your email address, which we promise not to spam. After that, sit back and enjoy the show. 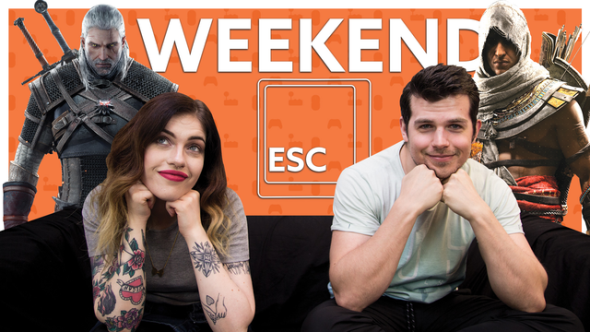 It is called the Weekend Esc, after all.